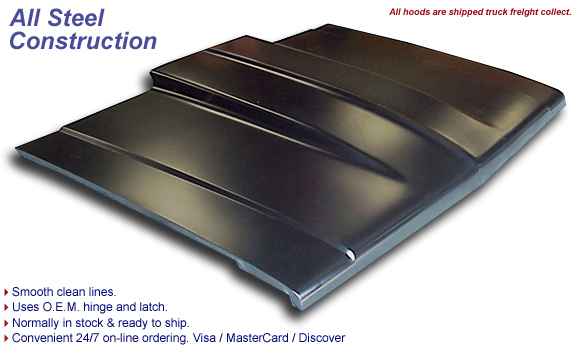 High-Tech tooling is now able to produce some of the finest custom direct BOLT-ON hoods. This hood is one of the best. The compound curves of the hoods surface is makes it stronger than stock. Steel construction allow for use with both OEM hinge & latch. Your O.E.M. springs and secondary catches are required. Side edges fit tight along fender lines. Scoops & baffles come with grills or door opening. The product listed above is licensed as a GM Restoration Part. 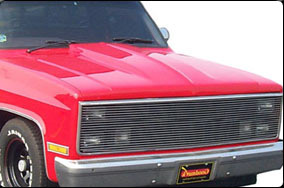 To keep your favorite vehicle in top shape, all it takes are Licensed Accessories or GM Restoration Parts. The Restoration Parts are built to GM specs by Licensed manufacturers and are labeled to ensure authenticity. Whenever possible, they're manufactured using the OE Tooling. All GM Official Licensed Products purchased from and/or installed by your GM dealer are covered under the individual accessory manufacturers' warranties, and they are not warranted by General Motors or its dealers. Should any such GM Licensed Product require service, please contact the GM Licensed Product manufacturer identified on the product or its accompanying documentation. If the manufacturer is not so identified, contact your GM dealer to obtain the necessary information. All steel products listed herein are top quality parts distributed F.O.B. from facilities located in Lawrenceville, Georgia 30045.